An overview of how tides form, and a summary of the author's travels there in June 2004. Man has dealt with the effects of tides since ancient times however, it is only in the recent few hundred years that their nature has become well understood. When one is at sea the effects of the tide changes may be a foot or two, barely perceptible. But along the shoreline the local factors including wind speed and direction, seashore depth and topography, and barometric pressure can come together to magnify the amplitude of the tide. No where on Earth do all the factors come to play in a more dramatic manner than at the Bay of Fundy and Minas Basin in Nova Scotia, Canada. I planned this trip so that I would be able to observe the tide changes in Nova Scotia near Perigee (when the Moon is at a point in its orbit closest to the Earth) and when the Moon is Full, this occurred most recently at 04:00 U.T. on 3 June 2004. I anticipated the weather would be cool and moderate in June ranging from forty four up to fifty two degrees F. I also chose these dates on which to make my visit because the area would be free of mosquitos and most other tourists, there would be no snow, and the daylight period was over sixteen and a half hours per day. Right: Bay Of Fundy with the hook shaped Cape Split and Minas Basin areas highlighted (47,012 bytes). Click on the image to see enlarged view (93,091 bytes). The most critical components of the trip would include good rain gear and layered clothing, good sunglasses (ideally polarized and photochromic), hiking shoes (though boots could have done better in some areas), and a pocket digital camera with a pocketable tripod stand. I chose to wear my trusty weather proof Leica Trinovid 10 x 32 BN Trinovid binocular in its Holster conveniently accessible outside my rain shell on a belt. I thought of taking a larger 42mm binocular but light gathering requirements for daytime observing did not justify the extra weight or bulk and I do prefer to "hike light". I also considered taking an portable astronomical telescope but noting the higher latitude, the brief nights at this time of year and what opportunities I might have to use a telescope, I concluded the effort was not justified. There are few astronomical events whose effects can be readily observed with the naked eye, among these are the tides. Tides result from the gravitational pulling effects exerted by the Sun and Moon on the Earth. In part because of these effects the Earth is not a perfect sphere, it actually is somewhat distorted bulging around its girth in directions both toward and away from the Moon. So the circumference of the Earth at the Equator is greater than that measured around the North and South Poles. As the Earth rotates the bulges move across the Earth so that the elongation of this circumference is always in line with the Moon. It is because water is more fluid than land that the sloshing produces the tides. While there are more than thirty other factors that can affect the time and amplitude of tides, the Moon exerts the greatest gravitational influence. The Earth rotates about 180 degrees in twelve hours. However, the Moon is rotating around Earth (with the same face towards Earth throughout) at a rate of about six degrees around the Earth in twelve hours. Due to the cyclic nature of the Earth and Moon system, the tidal period is twenty four hours and fifty two minutes long. The twin bulges and the Moon's rotation mean that any given coastal city experiences a high tide every twelve hours and twenty six minutes or so. Over the course of the full cycle any point on the Earth's surface will experience two high tides and two low tides. Particularly pronounced tides are experienced when the Sun and the Moon are lined up with the Earth at the New and Full phases of the Moon, although the tides will typically reach their zenith in a day or two after the astronomical influences have peaked. The most extreme gravitational tidal events are the "Extreme Proxigean Spring Tides" which occur when all of the tide producing factors in the equation approach that point at which they impart a maximum effect. Over the most recent four hundred years some thirty nine instance of Extreme Proxigean Spring Tides have been recorded, these occur every thirty one years. The most recent Extreme Proxigean Spring Tide occurred during the Full Moon on 7 March 1995, and the next will occur in the year 2026. Incidentally Sir Isaac Newton (b. 1642 d. 1727) was the first person to explain the phenomenon of the tides scientifically. He published this work on the subject in 1686 in his second volume of the landmark Principia. What Makes Nova Scotia's Bay Tides So Great? Since the topography of the shore and the ocean floor affect the range of the tides, not only does one have to consider the astronomical events but also the location where one will observe the effects. The Bay of Fundy and Minas Basin in Nova Scotia combine several rare properties that make this a great place to see the tides. Offshore Atlantic Ocean currents approach the Continental Shelf where they undergo a rapid decrease in depth with a ratio of depth to distance on the order of forty to one. The currents continue through the Gulf of Maine and then into the Bay of Fundy. The Bay has a wide and deep mouth and it will channel water entering the head of the Bay in a funnel like fashion on to its easternmost extremity: the Minas Basin. This process has a period of nearly thirteen hours, and this is similar to the above mentioned tidal period of twelve hours and twenty-six minutes. So in a manner similar to the swinging to and fro of a pendulum, the Atlantic tidal pulse pushes the water into the Bay of Fundy at nearly the optimum frequency to cause a large oscillation. As a result of these factors the volume of incoming tidal water is progressively forced upward exaggerating the tidal differences at its peak flow the tide can exceed the combined flow of all the rivers on Earth. 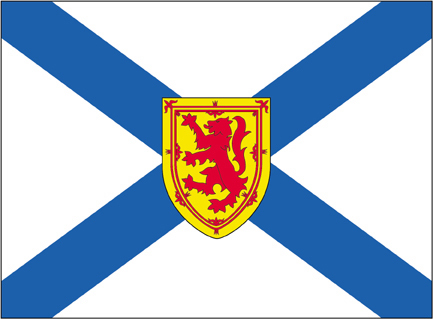 Above Left: Flag of the Province of Nova Scotia (7,136 bytes). Click on the image to see enlarged view (60,033 bytes). The greatest slosh occurs at the head or northeast end of the system in the Minas Basin. Because the Earth rotates along its axis in a counterclockwise direction as viewed from over the North Pole, the tides are higher in the Minas Basin than to the North of this in Chignecto Bay. The highest tides in the Minas Basin do approach fifty feet or more. 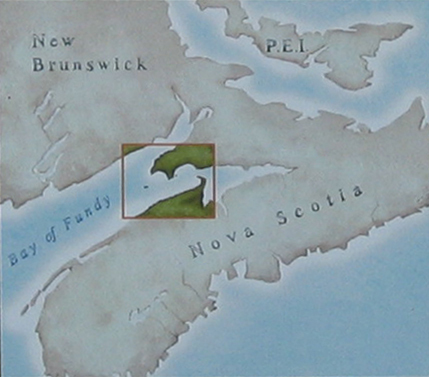 Right: Close in map showing western Bay of Fundy, Cape d'Or, and Cape Split the entry to the West Bay and Minas Basin (65,989 bytes). An added treat on the list of phenomena to see in the region is the Tidal Bore. A bore will form about halfway along the period of an incoming tide in areas where the incoming saltwater tide conflicts with the outgoing freshwater flow from a river. As the volume of water in the tidal bore pushes its way upstream against the freshwater flow, the topography in some areas this cause the bore to rise and attain a height of more than one half meter (almost two feet), it appears as one wide wave rolling up the river. 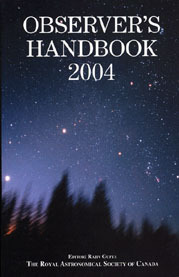 For some two decades I have subscribed to a very helpful annual publication from The Royal Astronomical Society of Canada. The "Tides and the Earth-Moon System" section of their Observer's Handbook describes the tides and where best to observe their effects. After many years of reading this over and over again I finally made the decision to visit Hantsport, Nova Scotia. It seemed to me that Hantsport could be not only a convenient location from which to view the tide but its effect would be made more obvious by the presence of the wharf, pier and occasional vessel mentioned in the Observer's Handbook. Hantsport also provided an attractive and affordably priced Bed & Breakfast which is situated nearby to the the major highway. This ready access to Highway 101 and Hantsports relatively central location along the Minas Basin's south coast made it a simple matter to explore north to Cape Split, then west to the Bay of Fundy. We would later tour along the north coast of the Minas Basin stopping in Parrsboro, Advocate and then on to Cape d'Or. Left: Tugboat "Atlantic Juniper" at Minas Basin Pulp and Power Company Limited Wharf near mid day high tide 3 June 2004 (33,788 bytes). Click on the image to see enlarged view (75,685 bytes). 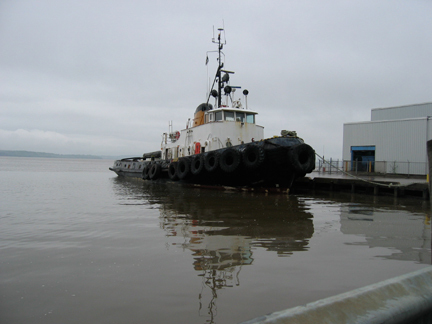 Right: Tugboat "Atlantic Juniper" at Minas Basin Pulp and Power Company Limited Wharf near mid day low tide 2 June 2004 (33,788 bytes). Click on the image to see enlarged view (75,685 bytes). a draft of 2.97 meters, and a D.W.T. (M) Tonnage of 437. While the tide effect seen along the Minas Basin Pulp and Power Company Limited Wharf is impressive, it is at Burntcoat Head where the tide rose to a record sixteen meters (52.6 feet) as measured by the Canadian Hydrographic Service in 1960 farther East at a Hants County bluff jutting into Noel Bay in the Minas Basin. Burntcoat Head is listed in the Guinness Book of World Records as the highest recorded tide. After Burntcoat Head, the tide table lists seven other local spots and then Hantsport with their local record of 14.9 meters (49.5 feet). I have come to understand how much time can be wasted trying to discern where to go, how to interpret directions, looking for missing road signs, etc. And so to save the readers who plan to make this trip some time and effort I include the "blow by blow" directions and my impressions of this visit. Our flights were arranged on Air Canada departing from Baltimore-Washington International Airport. We arrived at the airport too early for our 6:15 am flight, but in time to photograph a spectacular dawn. It seems that a one hour advance arrival for such early morning flights provides plenty of time to check in and clear the security checkpoint in a sparsely populated airport. After just under a two hour flight on the Dash8 turboprop to Toronto we changed to an A320 jet for the two hour flight to Halifax. Picking up a rental car at the Halifax terminal we found it a pleasant forty five minute drive heading north and west on Highway 101 to Hantsport. Our prior arrangements included reserving a Lincoln Town Car, this was assuming another couple would join us (they diss'd us). Soon after our arrival in Nova Scotia we would realize the value of ordering a premium car since the longer wheelbase, quieter and better ride suspension would speed negotiation of the often patched and potholed smaller roads we would travel. Continuing north beyond the exits to the city of Windsor, we left Highway 101 at Exit 8 for Hantsport. The signs to Hantsport from the exit directed an approach to town on Route 1 (Willow Street at this point) and we soon stopped to visit the Hantsport Tourist Bureau at 3 Willow Street. Here we were provided additional timetables and other hints about local sites from which to observe the tides and the tidal bore. A short drive further into town and we came to the intersection of Holmes Hill, Willow and Main Streets where we turned right continuing on Main Street. At William Street we turned right for the short drive to visit the wharf mentioned in the Observer's Handbook. 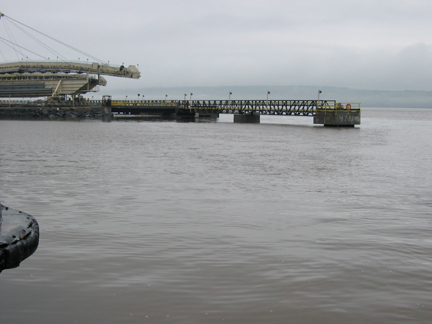 This wharf is property of the Minas Basin Pulp and Power Company Limited. It is open to the public daily from 6:00 am to 10:00 pm. 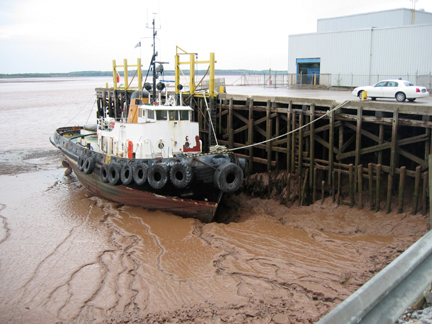 We arrived there in the early afternoon of 2 June near the low tide and we were amazed to find the tugboat "Atlantic Juniper" (pictured above) resting quite happily in the red iron rich mud of the Minas Basin. We parked our car on the wharf, and then strolled about sightseeing and taking pictures. There were no other visitors there at this time of day but we observed one crewman on the tug, he smiled up at us seemingly knowing how amused we (and the other thousands who visit) must be. As we looked across the mud slope to the left of the wharf we saw the massive steel and concrete loading pier of the neighboring Fundy Gypsum Company Limited (pictured below). From this pier ships load up to 25,000 tons of raw gypsum in less than three hours before sailing on the high tide. The steel pier appears to have replaced an older traditional wooden pier that is usually pictured on the Internet sites and older publications describing Hantsport. It became apparent how this former shipbuilding town had a natural dry dock location; this site was formerly that of the "Churchill & Sons" shipyard. 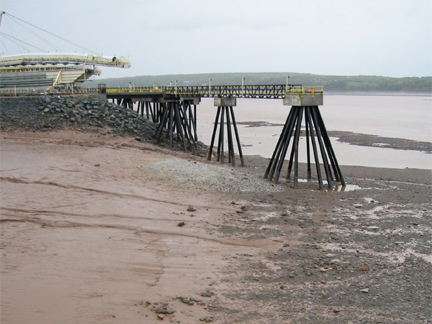 Left: Fundy Gypsum Company Limited loading pier at Hantsport near high tide 3 June 2004 (33,788 bytes). Click on the image to see enlarged view (75,685 bytes). Right: The same pier near the mid day low tide 2 June 2004 (33,788 bytes). Click on the image to see enlarged view (75,685 bytes). Note: Hantsport was selected as our first stop not because it has the largest tide amplitude, but because the effect of the tides are most dramatically apparent. After an exciting first stop on our journey we checked into "Pleasantrees" Bed and Breakfast; this appears to be the best if not the only B&B very close to Hantsport although there are others in surrounding communities too. It is not what we consider within casual walking distance of the waterfront. Pleasantrees is a modern home designed to be a B&B on an eighty acre forested lot. The proprietor Mrs. Lorraine McQueen insured this stay would be a pleasant and convenient aspect of our exploration of the region. Pleasantrees offers a choice of three bedrooms, use of a large heated indoor swimming pool, in a smoke free environment. The comfortable guest bedrooms share two clean and modern bathrooms and so this B&B can not (by the ratings system) earn more than two and a half stars. The better two of the three rooms each include a larger Queen size bed, and a wash sink. Since there were no other guests in during our stay we had the three bedrooms and two full baths to choose from. Pleasantrees is located at 242 Fuller Rd, Hantsport, B0P 1P0, telephone 902-684-3166. It is most easily approached from Highway 101 just beyond Exit 8 from Halifax, then turning left (heading south) at the nonstandard exit for Ben Jackson Road - note the overhead flashing yellow light at the intersection. Continue 3 km (about 1.8 miles) to the "T" which is Bishopville Road, there turn right heading away from Hantsport. Proceed 1.5 km (almost 1 mile) and then turn right onto Fuller Road. Continue on the gravel road for 1 km (about 0.6 miles) and turn right onto the private driveway for Pleasantrees. The lack of helpful street and exit labeling first became apparent to us in Hantsport while traveling on Bishopville Road. The critical turn to reach Highway 101 is onto "Ben Jackson Road". However, the road sign is visible only when approaching from the direction of Hantsport and there is no sign indicating Ben Jackson Road when coming from the opposite direction. The issue of signage could be annoying, but once it became most humorous later on after we finally departed Hantsport on Highway 101 heading south through Windsor. We exited onto to Route 14 heading southwest toward the picturesque Atlantic coast communities of Chester and Lunenberg. We followed the signs religiously but soon found that we had been directed back north through Windsor! We again entered Highway 101 south, then again exited onto Route 14. It was only after driving through a suspicious intersection for the second time that I did look back to notice road signs advising the turn to continue on Route 14. When coming from the South toward Windsor there is no indication at all that to continue on Route 14 one must take the left hand turn onto another road. Fortunately, the price of this delay was not too great. Hantsport is a small community with few accommodations or eating establishments. We found the "R&G Family restaurant", a popular local spot which provides an indoor dining area overlooking the Minas Basin. The restaurant features nightly specials and on our visit of Wednesday night, the restaurant is quite populated with those eager to have their Haddock "Fish Bits", something like shredded nuggets of Fish and Chips. One did not find a bad meal at any of the destinations we dined in. However, we later came to learn that paying upscale prices at an upscale restaurant did not necessarily find one leaving feeling any more satisfied that after dining at a small town local restaurant. Just down the road from this is Avon Street which parallels the Minas Basin, this is just west of the Gypsum and Power industrial area. The drive along this road is accentuated by several lovely Victorian houses overlooking the shore, and a small park at the end of the street with access steps down to the muddy shoreline. Wolfville: our first road trip headed west from Hantsport on Highway 101 to Exit 10 onto Highway 1 West. Our first stop was Wolfville which is a larger community located on the southern shore of Minas Basin, about a 16 km drive from Hantsport. To our right along the drive we enjoyed a panorama of vast shore and river areas with a muddy bottom uncovered by the fallen tide. While we visited in early June, we were informed about the peak migration in July and August of hundreds of thousands of shorebirds passing from the Arctic to South America. This must provide some spectacular vistas as the birds probe the mud for the hearty meals needed before their often several day nonstop flight to South America. It will be within a couple of hours of the high tide when these birds are pressed into the most congregated masses along the remaining exposed peak areas of the shore. Cape Split: for another more expansive realization of the tides we ventured to Cape Split where the Bay of Fundy funnels into the Minas Basin. This is reached by turning off Highway 1 in Greenwich onto Highway 358 to Scotts Bay. On Highway 358 too the road signs are infrequent, and we were not always certain when we were on the proper course. In this locality during the middle period of an incoming tide a deep resonating roar can be experienced along the high cliffs and wooded coastline as the massive flow of water passes through the five km (three mile) wide channel along along the north coast of Cape Split. The incoming current will often exceed fifteen km/hr, and this is agitated into turbulent tidal rip currents by submarine ridges throughout the area. The fourteen billion tonnes (fourteen cubic kilometers) of water flowing in is so great in this channel at the peak incoming and outgoing times that the flow equals the combined flow of all the streams and rivers on Earth! Three hours later the flow in peaks and then begins its return voyage from the Minas Basin to the Bay of Fundy and on to the Atlantic Ocean. After about a half hour drive in the rain from Wolfville, we left our car at the parking area near Scots Bay. The time during our hike remained considerably cool and wet, with a constant light rain, stiff breezes and some gusts. These factors assured that no matter what obstacles of mountain, ocean and woods we would encounter, there would be no other tourists foolhardy enough to make the primitive four hour round trip hike and ruin our photo opportunities. We took rain gear but we did not bring hiking boots, so when we entered the park trail we encountered mud and hard to walk over round rocks along the first hundred yards or so of the path. This soon became much more navigable and most of the remainder of the hike was a beautiful experience. Canada must be lacking lawyers since one can actually hike at times dangerously close to precipices that overlook long drops onto inhospitable looking, exposed rock shoreline. As we reached the tip of the Cape I worked my way down to the rocks along the shore to find them negotiable, but at some areas quite slippery. With little knowledge of the paths, and not wishing to get caught up in a rising tide along a steep shoreline the return walk followed the easier paths through the woods. Due to the rain we were not able to see any distant shores. The flow in and out so erodes and suspends the red colored soil of the area so that that the water in the Minas Basin is never transparent. One could bring cheap clothes to swim in, but do not count on living too long in the cold waters. After the hike to Cape Split we drove west defying the Nova Scotia road signs and actually finding our way to Halls Harbor. This small fishing village dock is located on the Bay of Fundy's south shore. And this is the site of the "Halls Harbour Lobster Pound" restaurant and gift shop. This restaurant overlooks the harbor which at the time of our arrival looked more like a mud pit with a few boats resting upright along the wood pier. Unfortunately the indoor dining area does not overlook the Bay, although Bay side outdoor seating was available; being fair weather tourists we dined inside. Left: Halls Harbour Dock looking from the direction of the Bay towards inland, near low tide 3 June 2004 (60,739 bytes). Click on the image to see enlarged view (113,843 bytes). Nova Scotia has long been well regarded for its seafood. Now a dwindling commodity as seafood stocks are fished into extinction, the Atlantic Lobster remains readily available and quite delectable. Among my goals of this trip were to eat Lobster and fish every meal; breakfast, lunch, dinner, midnight snack, etc. While in Hantsport I was pleased by the Fish Bits offered in the town restaurant, I looked forward to visiting Halls Harbor for my first "no doubt about it" Nova Scotia seafood meal. One can select scallops or other items on the menu but here the Lobster rules. Once may select and then buy a live Lobster for take out, or have it cooked for dining on the premises. With a cost of about $10 to $11 Canadian per pound (depending on size) for a complete fresh off the boat, cooked Lobster dinner this was starting to sound as good as it gets. Lobsters are kept in a tank in the gift shop, with Lobsters ranging in size from small to jumbos of over 5 lbs. As much as I was feeling awkward about having been introduced to my dinner, my appetite got the better of me. On our third day in Nova Scotia we decided to take a leisurely drive to Cape d'Or. The skies were clearing and this would provide the opportunity to view the expanse of a low tide shore and distant islands, see a Tidal Bore, and visit other attractions along the way. We stopped along the way to visit a couple of decommissioned lighthouses, and we enjoyed the panoramic view reveled by the retreated tide. It was in the Bay of Fundy Geological Museum in Parrsboro where I learned how millions of years ago Nova Scotia had been a part of north western Africa. As the Earth's crust shifted and the tectonic plates of Africa and North America separated, Nova Scotia was left behind. Left: Imagine a Mars-scape with a trickle or two of water. 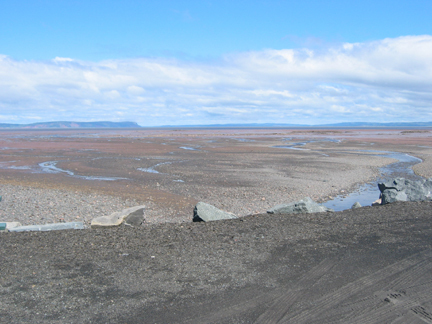 View typical of the areas exposed near low tide as observed along the eastern coast of the Minas Basin. The vantage point is a cliff that overlooks a drop to the mud and rock flats, this depth can be difficult to comprehend in an image (33,788 bytes). Click on the image to see enlarged view (75,685 bytes). While in Parrsboro we stopped by to visit the Parrsboro Rock and Mineral Shop and Museum and the proprietor Mr. Eldon George was in. This patient and self taught expert began collecting rocks in his preteen years. He explained how over his fifty six years of efforts he discovered many samples of minerals, gemstones, and fossils a number of which are fossilized footprints. He found a very large amphibian footprint in 1949 and numerous dinosaur footprints since then not far from his home. On 10 April 1984 Mr. George unearthed a fossilized track of footprints of the world's smallest dinosaur at Wassons Bluff. The tracks, about the size that might be made by a Sparrow were most likely made by a Coelophysis sp. This discovery brought worldwide attention to the Parrsboro area and earned for Mr. George some notoriety in the world wide professional community. This significant fossil remains on display in the shop, along with other finds he has made in the area. The shop sells fossils, minerals, gemstones, and jewelry. Dory Rips: the last village bordering the entrance driveway to Cape d'Or is Advocate Harbor. From here on the drive is on a climbing, narrow winding red stone and dirt road. At the end of the short drive is the parking lot with access paths to two overlooks. The overlook to the right views the area west above Advocate Bay and onto the Bay of Fundy; its entry path is marked with a sign "Extreme Danger Beyond This Point" - but probably due to some shortage of lawyers in Canada visitors are provided the right to choose where to walk. While the other observation point presents views east towards Cape Split, south and west to the Bay of Fundy, and it overlooks the picturesque lighthouse complex below on the point of the Cape. From the vantage points one may see how the tide flows in a clockwise spiral from Advocate Bay along the west face of the Cape and then clashes with a counterclockwise current coming from Greville Bay (just east of Cape d'Or and along the Minas Basin north shore). A third flow comes up from the deep and underwater obstacles including a large basalt reef off the Cape produce near vertical waves or "overfalls". The collision of these three massive flows form the violent "Dory Rips" just off shore. We made the walk down the dirt path from the overlooks to the current active lighthouse complex. The lighthouse is sited nearest to the cliff face. Behind it and nearer to path which goes up to the overlooks and parking areas were two buildings, one of which is a cleanly appointed restaurant. The restaurant door was open but no one was there; we imagined how nice it would be to dine while enjoying the view of sunsets and the tide activities. The restaurant visit did remind us that we could use a bit to eat and so we stopped in Advocate to dine at the "Harborlite Restaurant". At every stop we were pleased by the consistently good quality of the seafood. The light stock Seafood Chowders formula seemed to be the norm in the areas we visited. Since the tides are primarily affected by the gravitational forces of the Moon the tides operate on a "Lunar Time" schedule. The Moon circles the Earth such that it completes one revolution in about every twenty five hours, consequently the Moon rises past the horizon at about an hour later each day and the tides too will arrive about an hour later day after day. This progression of time is easy to comprehend by studying the tables above. There generally are two high and two low tide events occurring on each day. However, since the Moon circles the Earth in about twenty five hours every several days only three tide events will fit into a twenty four hour period. There were no instances of only three tide events in one day from 2 June to 6 June 2004, and so every date above shows the typical four event series. Atlantic Time is one hour ahead of Eastern Time so that 01:00 AT = 24:00 ET, 09:00 AT = 08:00 ET, and so on. Most internationally quoted times are in Greenwich Mean Time (GMT) or Greenwich Mean Sidereal Time (GMST). The central meridian for this time zone is at 0 degree Longitude, and so it is so named because it passes through the astronomical Old Royal Observatory in Greenwich, near London England. The local time is determined by considering the GMT and then adding or subtracting a number of hours determined by how far East or West one is from Greenwich. For example persons in Nova Scotia on Atlantic Time Zone are four (4) hours behind GMT, those in Washington, D.C. on Standard Eastern Time are five (5) hours behind GMT. Universal Time is Greenwich Mean Time corrected for small shifts of the Earth's crust east or west at the meridian at latitudes north or south of the meridian caused by action of the subtle polar wobble motion during Earth's period of rotation. If this shifting back and forth were not accounted for then the errors in time could amount to as much as sixteen (16) minutes from Greenwich Mean Siderial Time. U.T. can be thought of quickly as being about the same as the time in Greenwich, England but with minor refinements provided by use of advanced astronomical measurements, GPS, and laser ranging to objects positioned in space or on the Moon. Some published tide predictions show local Standard Time and may not correct for Daylight Savings Time which is observed in most of the USA and Canada during the Summer months. You may need to convert according. For an excellent discussion of time and time standards one should read the article "Time and Time Scales" by Roy Bishop. This is another of the interesting articles which are published in the annual Observer's Handbook. The low tides in this region reveal incredible panoramas of flats and islands which invite explorers to tread into dangerous territory. By failing to plan and schedule accordingly in advance, one faces the dangerous prospect of being trapped by rising waters. Yelling for help may prove fruitless since the sounds made by the onrushing current can drown out (pardon the pun) a victims cries. Any attempt to wade across even the most placid looking shallow flow could be met by dangerous currents or rip tides, mud that will sap your strength and slow your egress, and debilitating cold water. Parents should keep children under close supervision. Never become so distracted that you keep your back to the water too long. Do not put yourself in a position where you attempt to wade or swim through flowing water. Be extra careful around off shore sand bars and high spots since they may border trenches of deep water and strong currents. Plan to survive - travel within a reasonable distance from a reliable walking path to the shore and high ground. Carry some means to call for help (Cell phones may work, or signal flares, etc,). Let others know your plans - the route and timetable so that if you become overdue then they may come or call for help. And finally, understand that even if help is called for promptly it may take a long time for rescue teams to be alerted and arrive on site. One should consider themselves self reliant when traveling out of sight of others. We continued our visit by touring the Atlantic coast communities from Chester heading east through to Halifax. Halifax is the world's second largest sea port and has been no doubt dependent on that aspect for its economic vitality. There in keeping with our goal of avoiding "cookie cutter" hotels we had reservations to stay at the Halliburton House Inn, at 5184 Morris Street, Halifax, N.S. B3J 1B3, telephone 902-420-0658. It turned out to be a fortuitous choice since after a time of much driving and hiking a good quality rest would be most welcomed. This is a four star Inn, the only Inn so well regarded in Halifax. It is situated conveniently near to the sights we wished to see. This historic building built in 1809 now offers twenty nine wholly adequate and comfortable guest rooms. A light breakfast buffet is included with the room. The Halliburton House features "Stories", one of the finest contemporary restaurants in the region. Open every evening, reservations will be almost mandatory when the high tourist season kicks in. It was while we were settling into our window side table that we overheard several Nova Scotia natives seated nearby complimenting the staff about how wonderfully prepared and cooked their meals were; this encouraged us to overeat - with no regrets! The menu choices included game, seafood, and beef so tasty and tender that we ordered one tenderloin to be refrigerated overnight and made into a sandwich for the next day. This was the finest repast during the course of our stay. Halliburton house is close to the most popular attractions including Halifax Citadel, a massive block and earthworks British fort overlooking Halifax now restored to its appearance in the mid 19th century. We found three or four hours was just about right for taking the walking guided tour of the fort, and extra sightseeing. It was a brisk and beautiful day to make the walk along the boardwalk to tour the Maritime Museum of the Atlantic. This contemporary museum houses a wonderful display of ship models and artifacts. Among the more poignant displays in the Maritime Museum of the Atlantic are those of artifacts recovered soon after the tragic sinking of White Star Liner Titanic on the night of 14-15 April 1912. The loss of Titanic included 1,523 men, women and children. The S.S. Carpathia rescued 705 people on lifeboats. The White Star Line soon contracted two commercial cable laying vessels in Halifax to steam to the site and recover bodies. The MacKay-Bennett with an all volunteer crew departed on Wednesday 17 April and began recovery efforts on Sunday morning. Soon after the Minia arrived too. A total of 328 bodies were recovered but of these 116 unidentifiable were buried at sea. There were 209 bodies returned to Halifax. Today three of the city cemeteries contain the graves of 150 known and unknown victims of which 121 are interred in Fairview. Fifty one bodies were claimed and taken elsewhere. Some of the decisions on who to bury where, and with what ceremony were based solely on the victim's last name. Those though to be Catholics are buried at the "Mount Olivet Cemetery", with Jewish victims at the "Baron de Hirsch Cemetery". The others are interred at the non-sectarian "Fairview Cemetery". White Star Line established a trust fund for care of the graves, and Cunard which acquired White Star Line in 1934 provides assistance to this day. Right: Headstone of small boy laid to rest among the other victims of the Titanic. White Star Line received many requests from donors to pay the child's burial expenses, but it was the request from Captain Lardner and crew of the recovery ship MacKay-Bennett that was granted. Six MacKay-Bennett crew members carried the small white coffin, covered in flowers, to the hearse for burial at Fairview Cemetery. 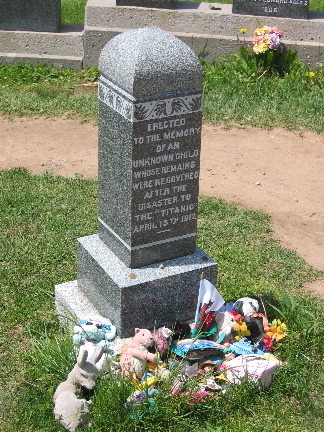 The headstone reads "Erected to the memory of an unknown child whose remains were recovered after the disaster to the Titanic, April 15th, 1912" (75,198 bytes). Click on the image to see enlarged view (146,300 bytes). I was told by a friend that this is a special place, and so on 6 June our last day in Halifax, we made the trip to the nearby Fairview Cemetery to complete the loop. The rows of dark gray granite headstones are engraved with a number which indicates the order in which that victim was recovered, the date and mention of the disaster. Some headstones also note the occupants name, date of birth or age, and maybe something about that person, or they are otherwise marked "Unknown". Recent efforts to identify more of the unknowns have employed DNA technology with some success. We closed our stay with a poignant walk through Point Pleasant Park in Halifax. Located at the extreme south end of the Halifax peninsula, the park had just reopened with a celebration after having been decimated as Category 2 Hurricane Juan struck early on 29 September 2003. The image at left reveals how this very dense area of forest was thinned out by maximum sustained winds of 100 mph (162 km/h), leaving younger more flexible trees standing. Many old large trees were tumbled or snapped like match sticks. Most of what was left were paper bark Birch, and Pine trees. While many mourned the destruction and loss of so many trees, other trees survived and the smells of decaying trees and spring in the park had even the loose pet dogs appearing to smile on this beautiful day. Left: Evidence of another less benign natural wonder; areas of decimated trees after clean up efforts at Point Pleasant Park, Halifax. Stumps mark the spots where large trees once stood, now cut up yet many cut up tree trunks were left in pace to decompose (80,104 bytes). Click on the image to see enlarged view (159,433 bytes). Images can not do justice to the magnitude and breadth of the scenery. This is a country, a people, and a natural effect that can be read about; but all are best when experienced first hand. We at Company Seven hope this article will bring those who can never make the journey some semblance of what we experienced.